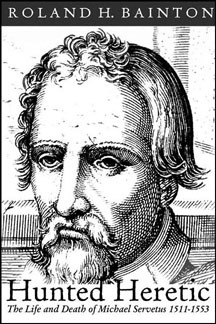 Michael Servetus, a Spaniard executed for heresy in John Calvin’s Geneva, is remembered as an important Reformation-era theologian and as a physician credited with the discovery of the circulation of the blood through the lungs. His first book, On the Errors of the Trinity, so shocked both Catholics and Protestants that he was compelled to live under an assumed name. All but a few copies of his magnum opus, The Restoration of Christianity, were destroyed shortly after publication. However, the case of Servetus, which has been taken up by Voltaire, Gibbon, and many others, marks the beginning of the idea of religious toleration. Roland H. Bainton’s classic biography of Servetus, first published in 1953, has been reissued in a joint publication by Blackstone Editions and the Unitarian Universalist Historical Society.